Going through our blog posts, we realized we didn't have a lot of Vietnamese recipes at all. How could that be? We love Vietnamese food: why haven't we been making it at home? 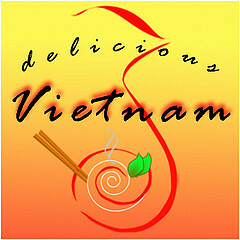 A new blog event, Delicious Vietnam, is certainly an opportunity to rectify this situation. When I butcher a chicken, I usually have several uses for the legs and thighs and can easily transform them into something palatable. The breasts, however, are a different story. I seem to get stuck in a rut with breasts, opting too often for chicken salad or Thai basil stir-fry. When I don't feel like eating those two options, I find myself in a race against time, before the meat starts exuding that dreadful chicken BO. After a quick browse through Wandering Chopsticks, we have killed two birds with one stone by making Vietnamese Chicken Cabbage Salad (Goi Ga Bap Cai). I was too lazy to poach the chicken breasts, so I cooked them in a pan. So, they're not exactly shredded chicken, but it was all right by me. Too bad we didn't have red onions. They would've been prettier. 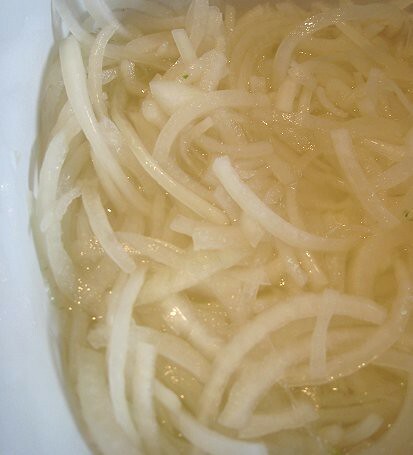 For these pickled onions, it was a matter of adding rice vinegar and sugar to thinly-sliced onions and letting them sit. 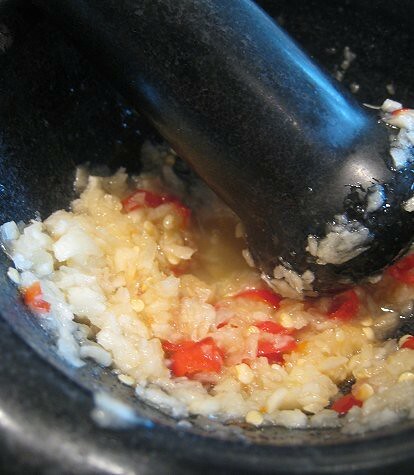 I mixed together garlic, chile peppers, sugar, fish sauce and vinegar (in lieu of lime juice). I was already in the middle of this prep when I realized that we didn't have any limes in the house! Quel horreur. I shredded a cabbage head and a couple of carrots. I had half a cucumber in the fridge so I shredded that too. Then, I realized that we didn't have cilantro in the house! How is that possible? We did have some Thai basil and some flat-leaf parsley, so that's what I added to the salad. 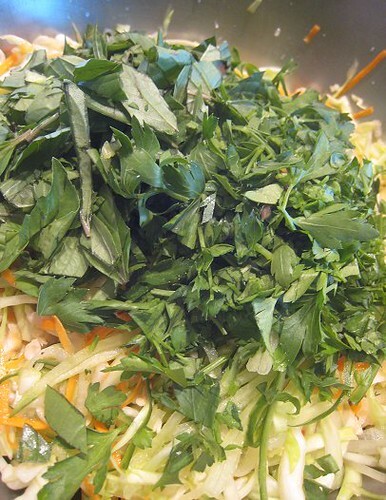 It was simply a matter of mixing everything together: chicken, hanh dam, nuoc mam cham, shredded vegetables and chopped herbs. There has to be a better English translation because "sesame seed cracker" doesn't quite do these justice. 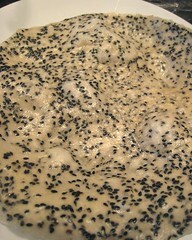 We first learned about banh trang me on a Food Safari episode. The girl making green papaya salad simply popped one of these in the microwave, then served her salad on it. So, when we saw a package of banh trang me on the aisle while trolling through a Vietnamese supermarket, we snatched it up. This package of sesame rice crackers was fragrant with coconut milk. 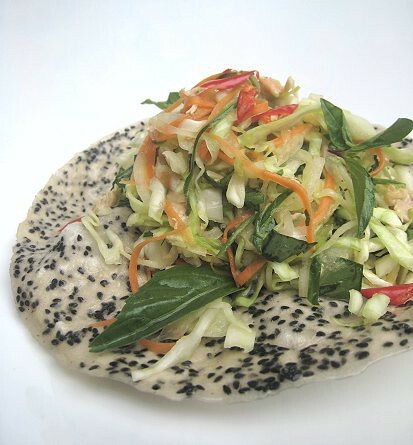 Following her lead, here's our chicken cabbage salad on a sesame rice cracker. We are submitting this post to Delicious Vietnam, a blogging event founded by A Food Lover's Journey and Ravenous Couple. For more information on this first edition of the event, click here. The round-up will be hosted by Anh of A Food Lover's Journey. How absolutely gorgeous! I need to start making more Vietnamese food at home. What a delicious dish! I would love to try those rice crackers. You should think of submitting this to regional recipes since the theme this month is Vietnam! love it! 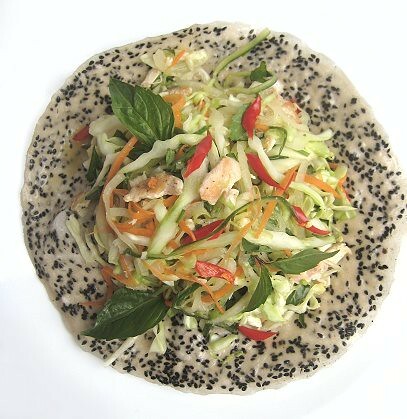 awesome use of the banh trang!! Wonderful dish and you really got my curiosity going with that cracker! 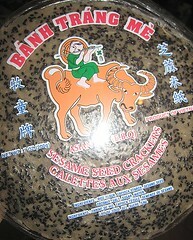 I love crackers and next time I go to Vietnam Mall, my neighborhood market I will seek all these ingredients out! 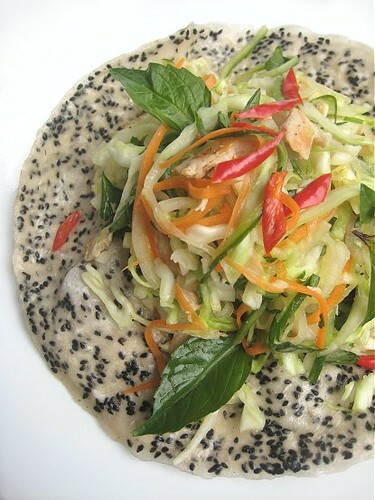 I translate banh trang me as toasted sesame rice paper as that's what it is. You can do microwave, but I'm old school and toast it over flames. It's so pretty! I am with pigpigscorner though and generally not a fan of breast meat, but I will always give every dish a chance. Count me and Christina in for not being fans of chicken breast meat. That said, the use of it in this salad, with all those really moist morsels is genius. And I'm sure the flavors here were excellent. On another (very different) note, thanks to TS for your Ajisai recommendation some time back. We went over the weekend and gorged ourselves silly; it is definitely one of the better sushi places in Vancouver. Just discovered this sesame cracker last weekend. 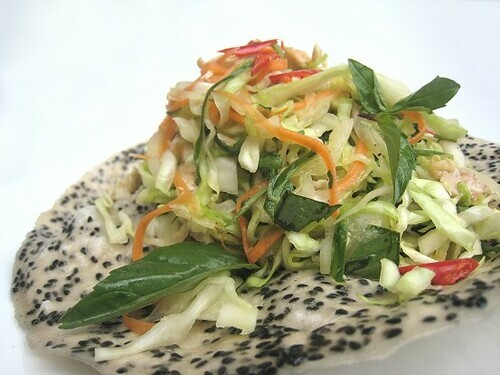 Delicious coleslaw, and great idea to replace prawn crackers with sesame cracker! I have been learning to love breast meat (always been more of a thigh girl) - it is good, as you say, in a stir fry, especially if you "velvet" it first with cornflour, soy sauce etc. This seems to work! I have yet to try this sesame cracker. Vietnamese food is really fresh and refreshing yet very flavorful. Yes, yes, I suggest making some Vietnamese dishes at home! I didn't even know that toasting it over a flame was an option. I thought one had to deep-fry it! Hence, the microwave was where we landed. Thanks! It was fun entering something into your event. They're not crucial to the dish, but those sesame crackers offer good snackin'. 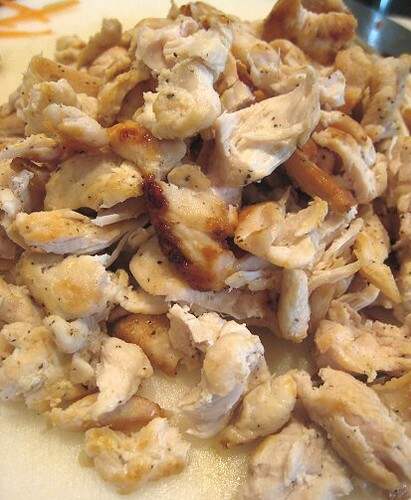 The trick to cooking chicken breasts, is to poach it at a simmer, for about HALF the normal time, then slam a tight lid on it and turn the heat OFF ! That way the meat stays juicy, not dry. The only other changes I would make to this is by using a Serrano Chili , seeded and slivered, instead of the Birds' Eye; Add chopped UNSALTED Peanuts at the last minute and TONS of chopped Celantro ! 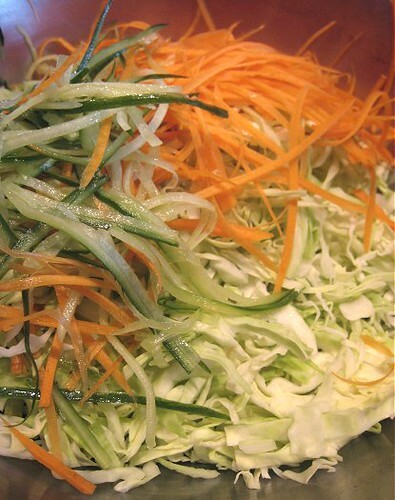 This type of Salad is even BETTER the next day; IF YOU CAN LEAVE IT ALONE THAT LONG ! LOL ! I am married to a vietnamese man who teaches me how to cook his homeland dishes. And this is REAL close. He is from Kiang Ghain ( "Keng Yang ") South Vietanam, as far south on the Mekong Delta as you can go. Maybe each area has it's own "recipe" for all the dishes ? I LOVE Vietnamese food and drive 300 miles round trip several times a year to stock up on ingrediants. Well worth it ! Thanks for the tips. And wow, 300 miles!